Vador is a 3 year old, yellow lab/golden retriever, service dog that we at Emory Veterinary Clinic have been seeing regularly since August of 2013. He is a great patient, and we always look forward to him visiting with Charlotte. We will let Charlotte tell the rest of the story. -He navigates traffic, street crossings, etc. -EVC is a very relaxed environment. He is ALWAYS excited when he sees that we are pulling into the parking lot to come to the vet. "I received Vador when I was 16 years old. I actually received him on my birthday. He was 2 years old when I got him. I travelled to New Jersey to the first guide dog school ever established. I stayed on campus for a month to train with my new dog. We practiced navigating traffic, street crossings, crowds, etc. It was a learning process figuring out how to “follow” your dog. It is nerve-racking to try to trust this animal to keep you out of harm’s way. Throughout the month, our relationship grew stronger. By the time I went home, I was totally in love with my new partner in crime. He has been the greatest decision I made. He helps me navigate the crowded halls at school and at track meets. He lays quietly on the track while I run and pole vault. Most of all, Vador has been receiving great care from the staff at Emory Veterinary Clinic. He loves Beau and the cheese that he always gives him. He loves Martha and Dr. Andrews as well. I have had him for about a year and a half and EVC has played a major role in keeping him healthy and happy. Most girls get a car on their 16th birthday. I got an awesome partner in crime. My car has 4 paws instead of 4 wheels. Vador went off to a “puppy” raiser when he was just a few weeks old. This puppy raiser was a young lady in college who taught Vador basic obedience. She took him EVERYWHERE, so he was used to all the social settings. He returned to the Seeing Eye campus when he was a little over a year old. The Seeing Eye is the name of the school I got him from. He then learned to be a guide for about a year. He was taught to watch for cars, notify me when a surface change was approaching, navigate crowded areas, and even lay quietly under my desk during class. 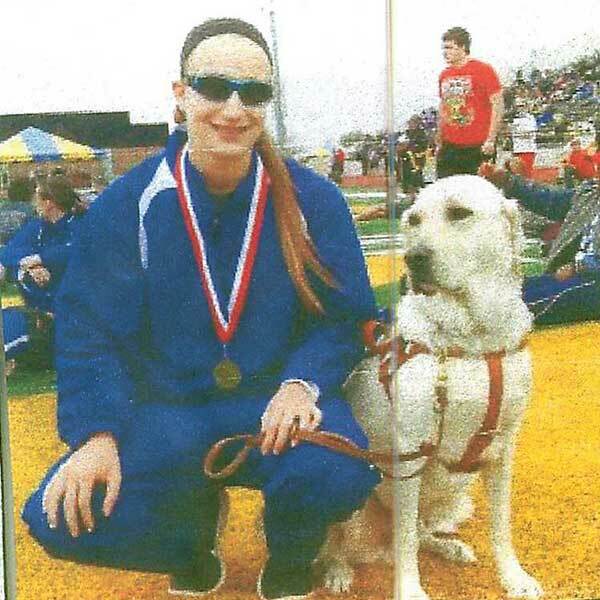 Next year, Vador will be making the journey to Purdue University to run track with me and get an awesome education." 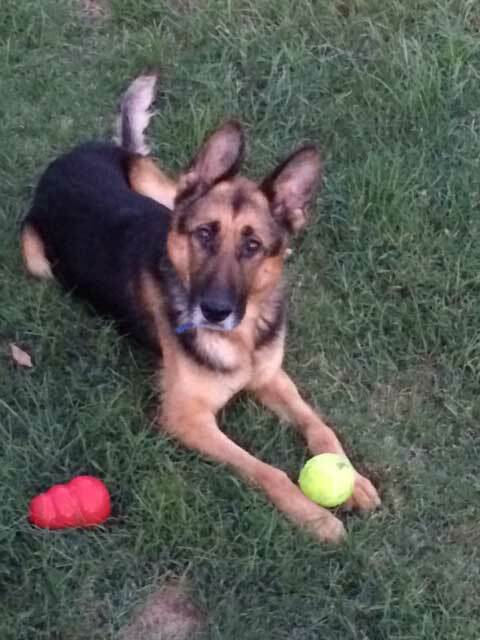 Fox is a 5 year old German Shepherd dog, who started visiting us in September of 2014. He is a decorated war veteran with several missions under his collar. Fox is double certified in patrol and bomb identification. He served our country in the war against terrorism in Afghanistan. Fox had to retire from active duty due to health reasons. 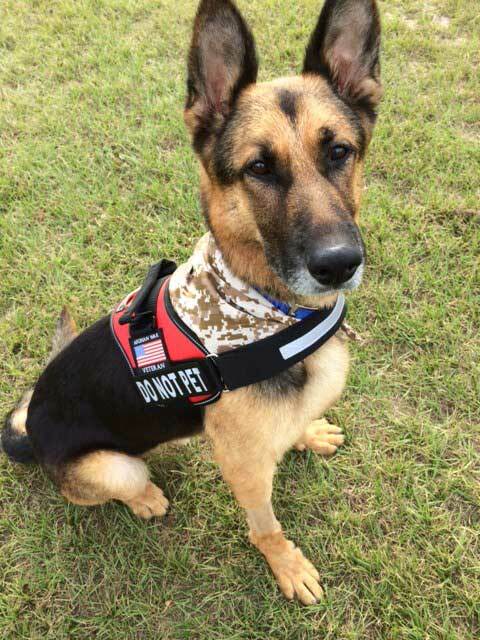 He was adopted from a service dog rehabilitation facility by Bob and June, who are retired police officers. 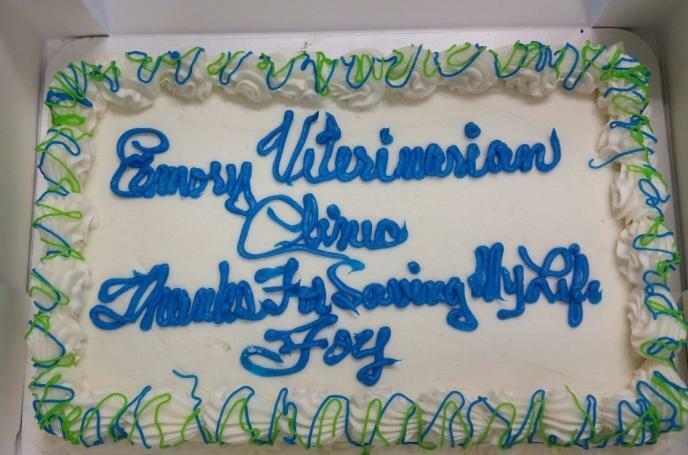 We at Emory Veterinary Clinic have had the opportunity to work with Fox through thick and thin, and he is now living his days in fun filled retirement here in East Texas. We look forward to keeping him healthy for many years to come.